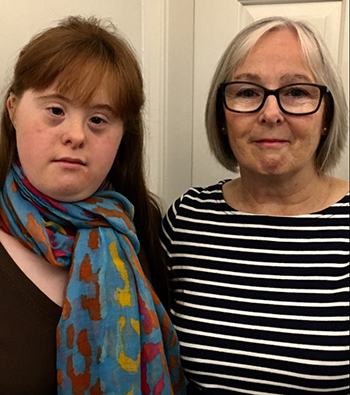 As the NHS prepares to introduce non‑invasive prenatal testing, a nurse reflects on bringing up a daughter with Down’s syndrome. As a parent of a daughter with Down’s syndrome, I was drawn to an article in the A-Z of syndromes series in Nursing Children and Young People's November issue. The article is intended for nursing professionals and students developing a library of evidence‑based good practice, and I have no dispute with its description of infants with Down’s syndrome. While expecting her, I had asked an obstetrician about screening, but was dismissed with a wave of a hand and the words ‘keep doing your exercises’. At the time, I was relieved that I would not be have to make a difficult choice about my unborn child and could remain the happy mum-to-be. Elizabeth arrived on her due date weighing a little over 5lbs, and it was immediately and heartbreakingly obvious to me that she had Down’s syndrome. There followed a mixture of responses from professional friends with ‘shock and disbelief’ at the top of the list. More than 25 years later we are entering a brave new world of non-invasive prenatal testing (see panel below left). You may say this is a jackpot moment and, as a nurse, I congratulate the people behind these innovative medical developments. The ethics of these medical developments have been questioned, however. After all, no one can predict whether or how a child will reach his or her full potential. Not all babies born with Down’s syndrome will need frequent medical care throughout their lives, although most will share common childhood illnesses. Elizabeth has taught me the value of difference and how to measure success. Her computer skills are fast and furious, and give her a wonderful link into her community. Now she is getting ready to move out of the family home to share a new home with three friends. She has told me she has chosen the colours she wants for the walls, carpets and soft furnishings. I suspect they will be the colours of Opal Fruits, but they are her choices for her forever home. My husband and I have done our jobs, as parents, for both of our children. We have seen them off as individuals to take their place in the world, safe in the knowledge that they will not be judgemental. I am writing this on my birthday and Elizabeth has just interrupted me to show me a video she has found online. It’s Elvis Presley singing ‘Happy Birthday, Mama’. I’m going to miss her. After last month’s Nursing Children and Young People went to press, details of a safer, more accurate prenatal test for Down’s syndrome emerged. Non‑invasive prenatal testing (NIPT), will be introduced by the NHS in England from 2018 with the aim of reducing the number of pregnant women undergoing amniocentesis, a test that carries a 1:100 risk of miscarriage. Experts calculate it could reduce miscarriages related to amniocentesis from 46 to around three a year. The new optional blood test is only a screening and requires a confirmatory diagnostic test. It also checks for genetic disorders, such as Edwards’ syndrome and Patau syndrome. In Denmark, where NIPT has been offered for ten years, 98% of women whose babies test positive for Down’s syndrome opt for terminations, and critics say the test may lead to more abortions in the UK. For example, Daily Mail columnist Dominic Lawson, whose daughter has Down’s syndrome, called the test ‘state‑sponsored eugenics’.